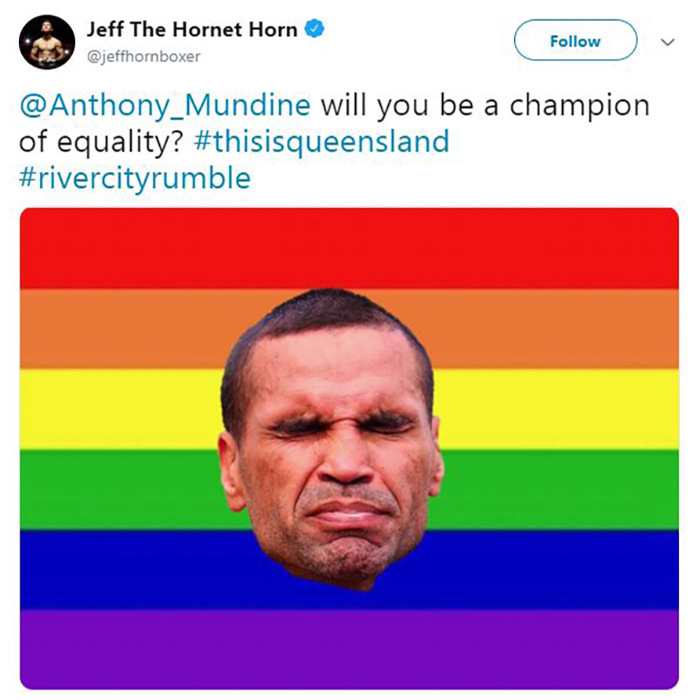 Boxer Jeff Horn has threatened to fire his promoters for publishing inflammatory posts about Anthony Mundine on his Twitter account without his permission. Promoter Dean Lonergan has taken full responsibility for the Twitter posts, which pushed for the inclusion of gay and transgender people for the ring card team in the boxers’ upcoming bout on November 30 if Mundine agreed to it. The post also included a Courier Mail article where Lonergan introduced the idea, saying Mundine “is still a bigot” if he doesn’t support the initiative. Earlier this year, Mundine said in an interview with the Sydney Morning Herald that homosexuality is “confusing to society”. He later apologised. The posts were slammed as an insensitive attempt to sell tickets to the Suncorp Stadium fight. Horn said his promoters had access to his social media account. “They were meant to talk to me before they posted anything and they hadn’t and that’s when I’ve taken them down,” said Horn. Horn said his team has apologised. “It’s frustrating and they know they’re treading a very fine line with what they’re saying,” he said.